The oldest pile rugs made in Europe were those of Spain. They began to be produced in the fourteenth century when much of Spain was still under Muslim rule, and they clearly represent the impact of Islamic decorative art and technology upon European culture. 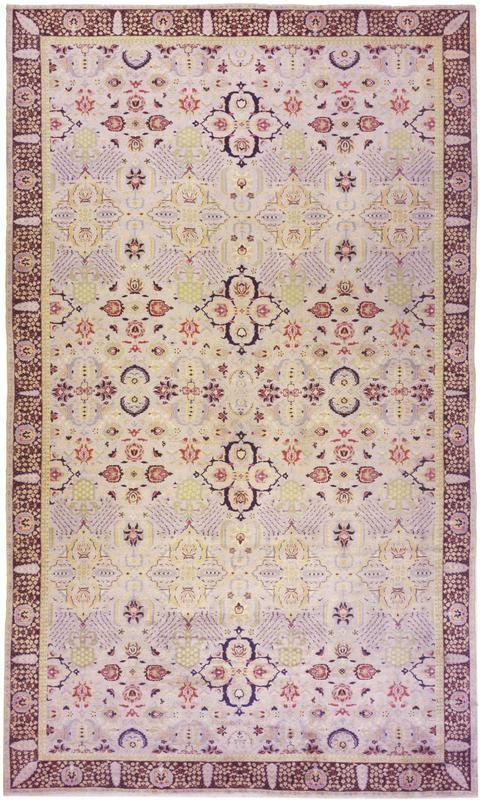 The earliest Spanish carpets were modeled on the15th century rugs of Timurid Iran and Ottoman Turkey with allover repeating floral designs, especially those of the so-called "Small Pattern Holbein" type. Spanish carpets continued to rely on such allover designs long after Islamic carpets switched to the more familiar centralized medallion format. This elegant example is faithful to the original Spanish tradition. It has a repeating design of staggered pointed quatrefoils with smaller secondary motifs, much like the Timurid and Ottoman originals. But the soft, pastel palette is typically Spanish and combines with the delicate tracery of the design to produce a lace-like effect that is nicely set off by the darker but still lacey border. The limited use of dark brown or black outlines for some of the quatrefoils creates a strong central accent or emphasis in the midst of the surrounding subtlety, almost like the smile of Lewis Carroll's vanishing Cheshire Cat.